When we were down in Dumfries & Galloway doing some research for one of Colin’s paintings, we noticed this interesting ruin by the side of the road. It’s situated close to the village of Mainsriddle, a mile or so north-west of Southerness on the Solway Firth. There was nothing to say what its name was, or anything about its history, so I did some investigating when I got home. It’s called Wreath’s Tower, and it was a tower house thought to have been built by James Douglas, the fourth Earl of Morton, in the 1500s. Douglas was a powerful figure. A staunch Protestant, he rose to become Lord Chancellor of Scotland, and he was, in fact, responsible for persuading the Mary, Queen of Scots to renounce the Scottish crown while she was imprisoned at Loch Leven Castle. After Mary’s escape from Loch Leven, Douglas fought against Mary’s forces at the Battle of Langside. The result was a decisive defeat for Mary, who had no choice but to flee to England and beg Elizabeth I for mercy. Douglas quelled any further Catholic support for Mary in Scotland, and became one of four Regents who governed the country while Mary’s son, King James VI, was still a child. Not much remains of Wreath’s Tower: fragments of the south and east walls, and the remnants of a turnpike stair and a doorway. The height of the stairway indicates that the tower was at least four storeys high, and the tower was oblong in shape. Although probably impressive in its day, this would not have been James Douglas’ only place of residence. In 1621 the tower and surrounding lands passed to Robert, ninth Lord Maxwell. Later, in 1773, the ownership was in the hands of a Richard Oswald of Ayrshire. An alternative spelling, used in 1655, is ‘Wraithes’, which does raise interesting possibilities. However, I feel sorry for any spirits wishing to haunt this particular building, because they don’t have much to work on. James Douglas met a rather grisly end, like many recklessly ambitious characters of his day. He was accused of helping to plot the murder of Lord Darnley, who was James VI’s father. Having introduced a new kind of guillotine to the country, he was one of its first victims when he was executed in Edinburgh in 1581. 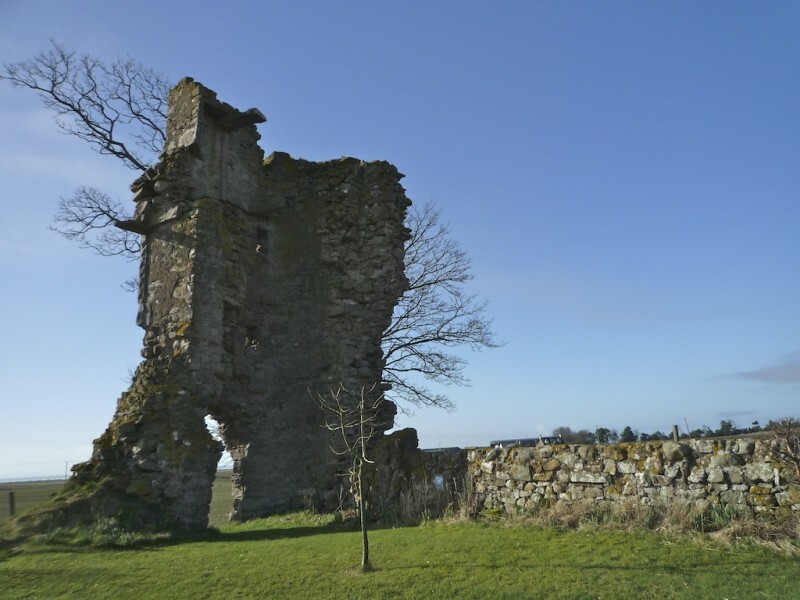 James V of Scotland, The Gude Man of Ballengeich, is alleged to have stayed here while visiting the Stewartry. Most of the tower was dismantled to use as stones for dykes & byres by local farmers & tenants after it fell into disrepair. That’s very interesting! Thank you for that, Stuart. Do you know how he came by his name of ‘The Gude Man of Ballengeich’?